Angry outbursts. Abrupt resignations. A Texas House speaker fleeing his own chamber. While Joe Straus is voluntarily stepping down as speaker, the day many view as pivotal to putting him in that position of power was far less orderly. Texas House Speaker Joe Straus sounded as if a weight had finally been lifted off his shoulders. Standing last month in the middle of a room crammed full of reporters, the San Antonio Republican explained his surprise announcement that he wasn’t running for re-election. Straus’ calm that day belied the tumultuous year that preceded it, one in which he led the Republican Party’s moderate wing in fending off a “bathroom bill” and other controversial measures backed by the governor and lieutenant governor. But his decision to highlight the orderly closure of his stint as speaker drew another contrast — with a chaotic evening 10 years earlier. 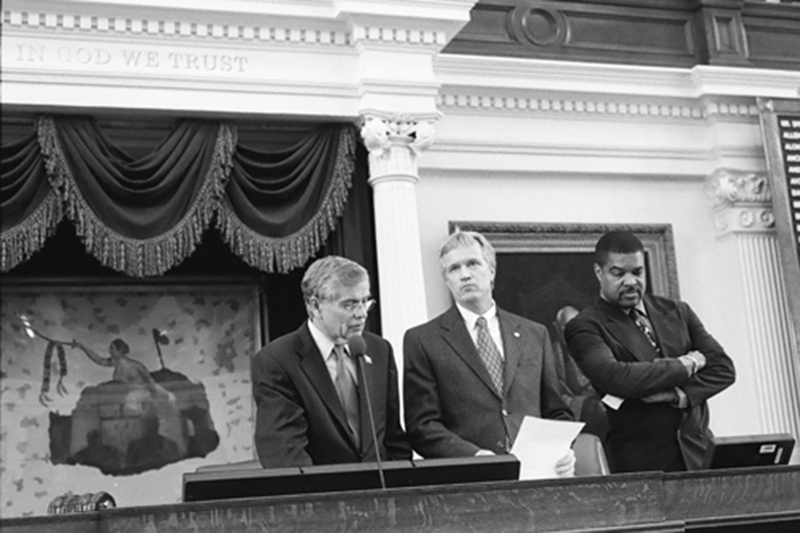 On May 25, 2007, efforts to unseat Straus’ predecessor on the House floor culminated in angry outbursts, abrupt resignations and a Texas House speaker fleeing his own chamber. Many view the evening as the fuse that lit a House revolt. And although Straus was just a background player at the time, his improbable ascendance from a second-term state representative to one of Texas’ most powerful politicians can be traced back to that unruly night. It was the final weekend of the 80th legislative session. Lawmakers had spent the past four months churning through thousands of bills. But, as inevitably happens as one session winds down, Capitol observers began looking to the next elections and the session that would follow. 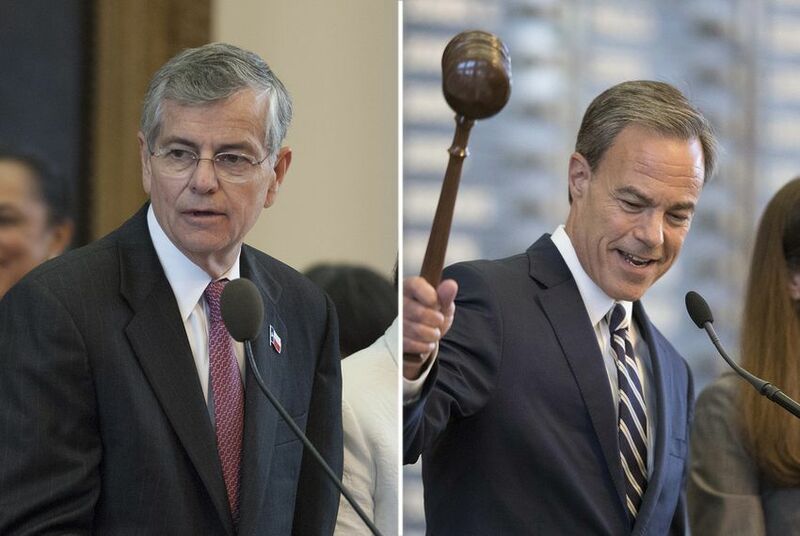 A question came up repeatedly: Would Speaker Tom Craddick hang on? Craddick, an oilfield drilling fluid salesman from Midland, first joined the House in 1969. He served under six different speakers, all Democrats, before becoming speaker in 2003 — the first Republican to hold that post since Reconstruction. Craddick became the most powerful House speaker in the state's history, gaining a reputation among allies for keeping a focused agenda and among critics for running the House with an iron fist. He also frustrated some detractors for backing primary challengers to House members he disagreed with. In 2007, most of the chamber’s 81 Republicans and a few of its 69 Democrats were Craddick supporters. The remaining Republicans and the bulk of the Democrats wanted a change. In the last weeks of that year’s session, a band of anti-Craddick members openly talked about replacing the speaker before the session ended. Ahead of that fateful Friday night, both sides were steeling for a confrontation and poring over the same playbook: the House rules. The Texas House governs itself with an arcane set of procedures. Parliamentarians advise the speaker on how to interpret them, but others often also weigh in. Will Hartnett, a Dallas Republican in the House at the time and a Craddick ally, recalled researching "ancient" legal precedents from the British House of Lords to advise Craddick on how to handle efforts to take him down. “Part of the problem with this whole issue was it was so late in the session,” Hartnett said. “It had the potential to be enormously disruptive because that's when the critical lawmaking really gets done.” Craddick and Straus didn’t respond to a request to comment for this article. The House had spent that Friday addressing dozens of bills that still had a shot of making it to Gov. Rick Perry’s desk. Around 7:30 p.m., Dunnam walked up to the chamber's “back mic” – a podium set up opposite from the dais where the speaker holds court – and kicked things off with the standard opener. "State your inquiry," Craddick responded. 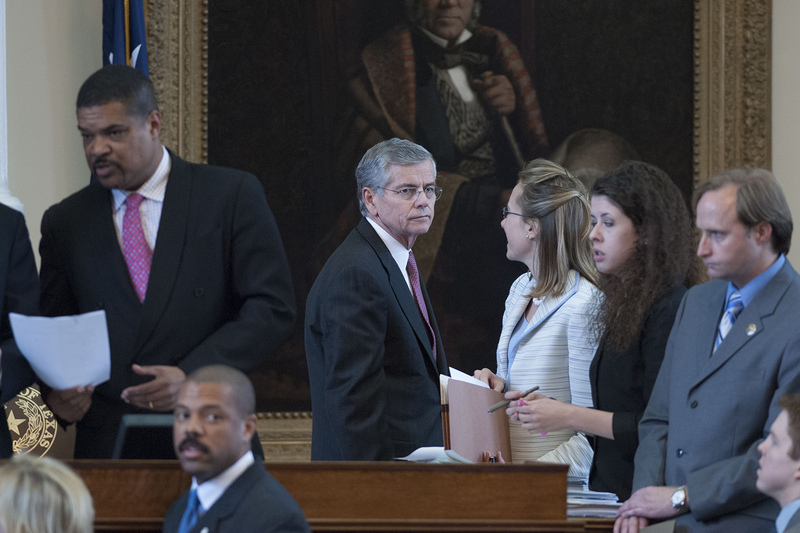 Those hoping to replace Craddick in the session’s waning days expected their approach would involve a member making a "privileged motion," a special request from a lawmaker that normally stops the House's proceedings in its tracks. The motion Dunnam was interested in was "vacating the chair." Dunnam asked Craddick if a "question of privilege" had to be recognized by the Speaker. Craddick said the speaker had “absolute authority” on such decisions. After some more back and forth, Dunnam asked, "Is a motion to vacate the chair a question of privilege?" "I don't believe there's such a motion in the rules," Craddick answered. "That's what it is, Mr. Dunnam." To many in the room, the gravity of the exchange didn't immediately register. But to the few who had obsessed over how Craddick might handle this issue, it was a game-changer. Craddick had just asserted that the room of elected officials who had selected him for another term as speaker months earlier could not unseat him without his consent. Even if a clear majority of the House were ready to see him replaced, he had declared he had the power to effectively block them from even trying. "And then all hell broke loose," Dunnam recalled. Soon, Euless Republican Todd Smith was at the back mic asking if Craddick had just gone against the advice of Parliamentarian Denise Davis. Smith was incredulous. "You don't know?" "I don't remember overruling my parliamentarian, Mr. Smith." Craddick went on to note that any conversations between him and his parliamentarian were protected by attorney-client privilege. As the questions mounted, Craddick announced that the House would briefly "stand at ease." Rumors spread across the House floor that the parliamentarian had resigned over some of the answers Craddick had just given. Without a parliamentarian, the House could not functionally operate. Nearly an hour later, Craddick returned to the dais and tried to continue with business as usual. Waxahachie Republican Jim Pitts, who had unsuccessfully challenged Craddick for speaker earlier in the year, kept the conversation on the elephant in the room. "Do we have a parliamentarian tonight?" Pitts asked. Craddick noted that Deputy Parliamentarian Chris Griesel was on the dais with him. Before Pitts could press the issue further, Craddick made a hairpin turn. "The House stands in recess until 11 o'clock." Over loud boos and shouts of "No!" and one person yelling out "This is America!" Craddick slammed his gavel down and hurriedly headed to a nearby exit. Soon after, the House floor transformed into a cluster of makeshift war rooms. Dunnam was at the center of a horde of Democrats. Pro and anti-Craddick Republicans were in their own huddles. Over the next two hours, the Texas Capitol was consumed with competing factions researching legal and parliamentary precedents, strategizing next moves and, most of all, speculating on how such a volatile evening would end. At 11 p.m., Craddick re-emerged with two new parliamentarians: former House members Terry Keel and Ron Wilson. Keel, a Republican, had ended his tenure in the House just four months earlier after a decade representing part of Travis County. Wilson, a Democrat, had represented a Houston-based district from 1977 to 2004. Both men, longtime Craddick allies, had reputations for having mastered the House rules. Craddick tried to steer the House toward the 11 bills still on the House calendar. He advanced through the agenda in fits and starts while arguing with members lined up at the back mic. Why did the original parliamentarians resign? Why did he recess earlier that evening over the objection of members? Craddick conveyed little information, often delivering verbatim what Keel instructed him to say. Craddick believed he would have probably prevailed on a vote on whether he should remain speaker, Keel said recently. But that wasn’t the issue. The most memorable exchange of the night came when Dunnam asked Craddick to recognize a motion to elect "an impartial parliamentarian." Craddick said that wasn't allowed under House rules. "Well, I would like to suspend the rules to offer such a motion," Dunnam said. "You're not recognized for that," Craddick said. "Mr. Speaker, can we appeal that ruling?" "You're not recognized for that motion, Mr. Dunnam." "Does anyone's voice in this chamber matter but yours?" "We're going to follow the House rules," Craddick said. "We're going to follow the House rules?" Dunnam asked. Dunnam waited a beat and then shot back, "When?" Laughter and applause filled the chamber. Rebuffing critic after critic, Craddick adjourned the House at 1:23 a.m. He later defended his handling of the evening as protecting his office for future speakers. “For a speaker to recognize a member for such a motion would not only be disruptive of the legitimate business on behalf of the citizens of this state that the House should instead be conducting, but it also would undermine the institution of the office of the Speaker of the Texas House of Representatives,” Craddick said in a prepared statement at the time. Though the session ended with Craddick still in charge, a cloud hung over the House dais. Amid the heated debates that night, Straus was largely seen but not heard. He was only in his second term in the House. And like dozens of other House Republicans, he was on Team Craddick. It wasn’t until more than a year later – days after the November 2008 elections in which Democrats shrunk the GOP’s majority in the House to a razor-thin 76-74 – that Straus signaled his split. "There are a lot of Republicans who feel the way I do, this goes deeper than the speakership of Tom Craddick,” Straus said right after the 2008 elections. “There is a feeling that the status quo is not acceptable." By December, there were nearly a dozen candidates for speaker not named Craddick. Yet the relatively junior Straus was not actively seeking the position. In early January, before the 2009 session began, the “Anybody but Craddick” Republicans met to unite behind one of their own. Amid more senior members jockeying for the coveted spot, Straus emerged as the consensus candidate. Most of the chamber’s Democrats signed on, clinching a majority of the House for Straus. Craddick gave up his bid for another term as speaker — but he remains in the House, currently serving his 25th term. 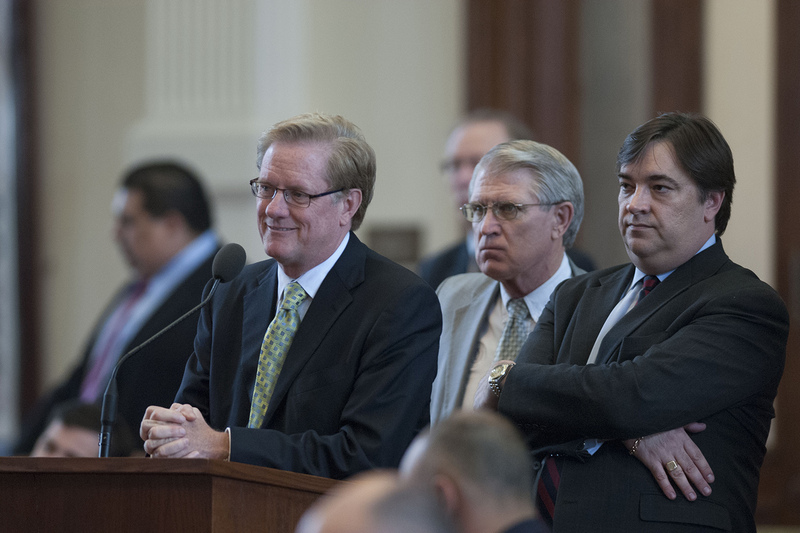 As Straus’ final term as speaker nears an end, House Republicans are seriously considering a plan to avoid his successor taking a similar path to the dais – drawing on a mostly Democratic coalition to crowd out competitors. Whoever replaces Straus on the dais will be impacted by the circumstances that propelled him up there. After the House formally elected Straus speaker in 2009, among its first actions was approving changes to the House rules. Perhaps the most significant: if a member of the House makes a motion to remove the speaker, the speaker has to recognize it if a majority of the chamber backs it. Eight years later, it has yet to be invoked. Clarification: This story has been updated to better describe the role of the parliamentarian in the Texas House.